LOAKL.COM | Is the Local Economy the Solution? You are here: Home / Retail / Is the Local Economy the Solution? Think local. Buy local. Support your local community. Community investment. This all makes sense, right? Right. Then why do so many government-funded economic development programs get this wrong? 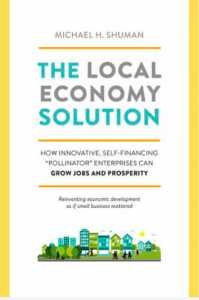 In his new book, The Local Economy Solution: How Innovative Self-Financing “Pollinator” Enterprises Can Grow Jobs and Prosperity (Chelsea Green, June 2015), Shuman debunks many of the myths around economic development—that tax breaks for wealthy corporations are beneficial for all, that only big businesses create jobs, that consumers only care about price, and that social enterprises can’t be self-financing. Shuman, who has been a leader in the local economy movement for more than two decades, proposes low-cost pollinator businesses to stimulate the local economy through small business development. He defines a pollinator as a self-financing business with a mission of supporting other local businesses. Pollinators lead to more dollars spent within that community, and often favor a triple bottom lineapproach that makes a connection between the three Ps: people, planet and profits. Unlike impersonal chain stores, local pollinator businesses foster more connection between consumers and retailers, food growers and customers, and businesses and their employeesm, resulting in a healthier, more equitable community, which translates into safer neighborhoods that can weather economic fluctuations. Without easy access to economic development funds, pollinator businesses rely on a DIY ethos and the sharing economy, which includes cross-selling with other like-minded businesses, cost-savings through collectively buying goods and services, and being creative with financing. The book offers models for how effective self-financing pollinator businesses work, making it a must-read for anyone interested in starting a local business. Yet the common thread among these pollinators is the creativity of the entrepreneurs who start them. From a clever, low-cost “Shift the Way You Shop” campaign that promotes consumer awareness about buying local, to a program that supports farmers in Paraguay with microlending, where small loans make a big difference, Shuman sees a revolution underway. He identifies five types of pollinator businesses: planning (business planning), purchasing (collective buying), people (training and mentorship), partnering (networks) and purse (financing) and shares business models for each type, from retail shopping networks and pay-it-forward food cooperatives to startup accelerators and credit unions. Kimber Lanning, founder of Local First Arizona, is just one of the many entrepreneurs who’s changing hearts and minds. She’s been instrumental in influencing how Arizona state procurement offices contract with suppliers. Lanning created a study showing that for every $100 in office goods sourced from national chain Staples, $5 was respent within the state. In contrast, for every $100 spent on the same goods purchased from a local vendor, $33 was respent within the state, demonstrating how profits earned locally recirculate in the region. Another example of a pollinator is Impact Hub; with more than 68 locations in 49 countries, this co-working space and business incubator is jumpstarting other social enterprises by housing startups where entrepreneurs gain access to workspace, mentors and financing. Impact HUB Oakland was one of the first tenants in a renovated historic building project called the Hive, which offers a mix of retail, housing and office space and features a honeycomb with the word “hive” painted on the facade. More financially creative pollinators include Bernal Bucks, created by Arno Hesse and Guillaume Lebleu, which started as an alternative community currency in the Bernal Heights neighborhood of San Francisco and evolved into what’s thought to be the first of its kind debit card, which can be used wherever debit cards are accepted, but with incentives for using it locally. Card holders earn 5% of their purchases back in Bernal Bucks when frequenting one of the participating community businesses, plus they earn $10 in Bernal Bucks for every $200 spent with the card (one Bernal Buck is equal to $1). While some of the suggestions are easy to accomplish, such as moving your savings to a local bank or credit union, others require more startup effort such as creating a local mutual fund or spreading self-directed IRAs. Still, Shuman inspires with what’s possible. Once you begin to understand how pollinators work, you might begin to see examples in your own neighborhood. Take Melissa Davis and Kristen Loken’s beautifully produced, coffeetable-worthy book This is Oakland: A Guide to The City’s Most Interesting Places. Lavish photographs of unusual, local shops and coveted restaurants pair with short profiles, all organized by neighborhood, making this a must-have for Oakland natives as well as newcomers. It’s easy to see how promoting these foodie destinations, hip artisans and colorful retailers serves to further establish Oakland as a desirable place to live and work, and attracts further investment to the city. Many of the retailers in turn sell the book, so it has a built-in distribution network. Many people hit hard by companies downsizing, outsourcing and automating, and simply failing to recover the jobs lost during the recession, would do well to look locally for solutions, whether starting a local business or working for one. Ernesto Sirolli, a business counselor with a popular TEDtalk who’s mentioned in the book, sees more women, downsized older workers and younger people starting their own businesses. One could say Shuman saw this coming. As a founder of BALLE, Business Alliance for Local Living Economies, Shuman has worked to shed light on how forging connections at the local level, between investors and entrepreneurs, businesses and communities, eaters and farmers, is beneficial for everyone. With all of this activity it would seem state and local economic development offices would be eager to latch on to the trend and engage smaller, locally owned businesses. But so far that hasn’t been happening, forcing local businesses to bootstrap themselves. So, just how do state and local agencies spend those seemingly scarce economic development dollars? According to Shuman, many focus on “attract and retain” schemes that incentivize large companies to relocate to an area in the hope of creating local jobs. These incentives are paid for with taxpayer dollars, and often involve wining and dining corporate representatives and competing with other states to win the bid with large payouts—including tax incentives, property development giveaways and cash incentives for job creation. Shuman cites a boondoggle in Sarasota County, Florida where officials were poised to cough up $137 million in incentives in an effort to woo a Danish pharmaceutical company to relocate, in spite of the fact the move would only create 191 local jobs. In the end, the region lost out to a neighboring state that offered an even better deal. Shuman believes even if a company accepts incentives and relocates, the community rarely benefits. That’s because the incentives offer a terrible return on the dollar, sometimes with tens of thousands of taxpayer dollars spent to create each job. Other times, the jobs just don’t materialize as promised, or the company’s existing workers relocate. What’s worse, the revenue generated by the company often leaves the area, heading back to corporate offices and senior executives, doing little to stimulate the local economy. After a while, the company, which has no real geographic loyalty, picks up and leaves when its incentives run out. Sometimes the new business even displaces an existing local business, because unsubsidized local businesses are hard pressed to compete with subsidized non-local ones. The economic incentives actually work to undermine the local businesses they should be supporting. With the economy spluttering, hopefully more people will see the value in supporting their favorite local cafes, restaurants and shops at the expense of the chains, and realize that keeping more money in the community helps their friends and neighbors too. Shuman’s book provides insight into the planning and consumer behavior shifts needed to make our cities and towns more resilient, safer and healthier, as well as real-world financial modeling for investing in, or starting a successful local business. There’s no better incentive to be a pollinator. February is Here— Are You Still Committed to Your Resolutions? Is it Love…or just Spring?